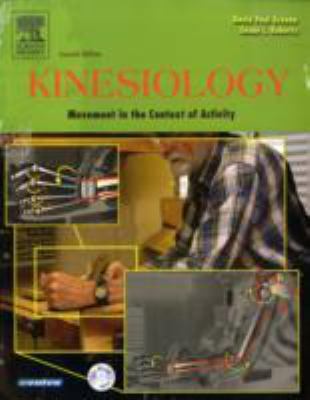 by Greene, David Paul, Roberts, Susan L.
Greene, David Paul, Roberts, Susan L.
Approaching the subject of kinesiology from the perspective of occupational therapy, this unique text written by occupational therapists examines the everyday activities of people using the principles of biomechanics to adapt to changes in their functional abilities. This new edition stresses applicability to clinical practice with the inclusion of case examples. In-depth coverage of wrist and hand pathokinesiology, as well as normal kinesiology function of the wrist and fingers Key terms, chapter outlines, and applications that enhance studying and learning 12 appendices and a glossary with metric conversions, review of mathematics, a diagram of body segment parameters, and laboratory activities New material providing explanations of the pathokinesiology of shoulder subluxation, rotator cuff tear, adhesive capsulitis, fractures, tendon injuries, and shoulder problems secondary to CVA More case studies and less emphasis on heavy calculations to ensure the concepts are more easily grasped Perforated lab manual filled with activities tied directly to the chapters Enhanced illustrations for easier visualization of the concepts demonstratedGreene, David Paul is the author of 'Kinesiology Movement in the Context of Activity', published 2004 under ISBN 9780323028226 and ISBN 0323028225.